Quickly and easily adjust shelves as your needs change! The Corner Release System makes changing shelf levels fast and easy, without tools and disassembling. Just lift the release on each corner, and adjust your shelf at 1″ (25mm) increments in seconds. No tools and no wasted time. Unique post design! Site Select™ post design provides a visual guide for positioning and adjusting shelves, saving time during assembly and adjustment. An easy-to-identify double groove, every 8″ (203mm), offers a quick way to align all shelves. Tool free, fast adjustment at 1″ (25mm) increments along the entire height of the posts. Open wire shelf design minimizes dust accumulation and allows free air circulation and better visibility of stored items. Accessibility! Shelves can be loaded and unloaded from all sides. Easy assembly! The Corner Release System and SiteSelect posts combined with the original “bottom-up” assembly process, creates a complete shelving system in minutes without tools. SiteSelect posts with the double groove visual guide feature, have circular grooves at 1″ (25mm) intervals and are numbered at 2″ (51mm) intervals. Shelves seat in place using the Corner Release. 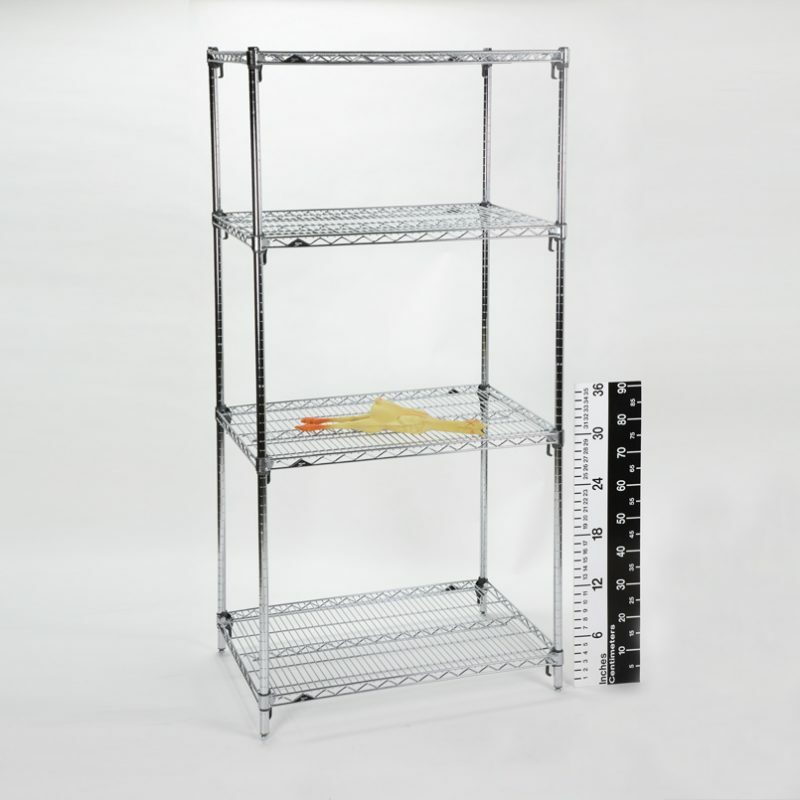 Four shelves, posts, and plastic sleeves are included with each shelving unit. Shelves and posts are chrome-plated. Total Weight Capacity: 2,000 lb. Shelf Weight Capacity: 800 lb. Shelf Inlays are hardboard mats that fit between posts and level with top of shelf edge to prevent small items from falling through wire shelves. Inlays are reversible; one side black and one side white. Available for #17208 and 17209. 4″H Shelf Ledges prevent items from protruding or falling from shelves. Available for #17208 and 17209. Additional accessories and shelving options are available through our Customer Service Department.